In some Orthodox countries there is a tradition of skilfully painting eggs before Easter. The tradition is very vivid in areas of Romania like Bukovina (the Nordic part of Moldova). A legend has it that when Jesus Christ was crucified, Mary Magdalene came at the feet of the cross with a basket of food she had bought. The blood of the Lord dropped over the eggs in the basket, turning them red. Following this legend, Christians in the East started painting eggs in red in the Thursday before Easter. This is still done in every Romanian family, using a simple method, by dipping the boiled eggs into a pot with food dye. But of hundreds of years, in villages of Bukovina, this custom was turned into an art. 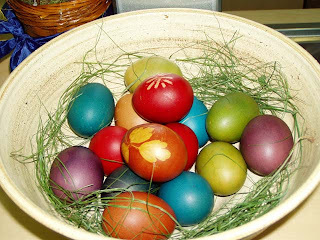 To paint the eggs, the peasants don’t use synthetic dyes, but rather natural herbs. They can obtain red from apple leaves, madder, wild rose, green from walnut leaves, sunflower, yellow from peel onions, privet, blue from violet flowers, black from nutshell and alder. The decorations are usually geometric, various shapes of flowers and animals, but got to the point where entire icons like “The last supper” or “Madonna with Child” were painted on an hen egg. 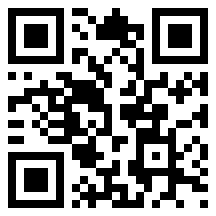 To achieve this, the peasants use the simplest tool (called kishitze), a stick with an iron tip. With this, they apply molten wax on the desired pattern of the first color. Then they dip the egg in the lightest color to be used. When heated, the protective wax melts away, and a new pattern can be added. Then another dip in a different color, and so on. As these little works of art began to be collected, popular artists are preparing them for the buyers. The substance of the egg is taken out through a tiny hall before boiling, so the crust is more resistant in time. Because of the demand, the craftsmen started also to paint ostrich eggs or wooden eggs. In the cities, the tradition is preserved in every house, but without the artistic painting part. The eggs are simply dipped in food dye, in various uniform colors, not only the traditional red. The symbolic aspect of painting and knocking eggs on Easter is far more important than the folkloric aspect later developed. In Romanian, the name for Easter is derived from the Hebrew name (Passover, from Pesah) of the celebration of the departure of the Jewish people lead by Moses from the slavery in Egypt. In Christian terms, the Easter is also a turning point, from the slavery of sin to the hope of another life. The egg thus serves very well this symbolism: its shell is like the stone that covers a grave, which when cracked opens the way into a superior form of living. When two Christians knock the painted eggs on Easter, the first one says: “Christ has resurrected!”. To this, the other responds: “Indeed He did!”. Romanians also use these two ritualistic formulas to greet on the street in the first week after Easter, as this is considered the defining affirmation of the Christian faith. Unlike other countries, in Romania the Church believes that Jesus was born during the winter solstice and his resurrection happened during the spring equinox, thus Easter in Romania is indication of the bountiful season of spring. Romanian Easter celebrations are looked forward with great enthusiasm, hope and joy. The actual Easter festivities in Romania begin with Flowers Saturday or Lazarus’ Saturday as this is also the time when the girls plant flowers followed by Palm Day also known as Flowers Day, Great Thursday and Great Friday. A week before the Easter i.e. on Flowers Day, prayers are offered in honor of Roman goddess Flora and willows are offered in her service. It is also regarded as the day for commemorating the dead and thus the burial places are cleaned and willow branches are put above those entombments. One of the major Easter customs in Romania is that on Great Thursday, as on this day Chairs with blankets are put near the fire, as it is believed that some dead souls will sit on those chairs while others on the ground. Girls and women of the house thereby carry water buckets to the graves for the dead ones who will sit there. Romanian Easter however remains incomplete with its traditional mouthwatering delicacies like “Pasca”, traditional lamb recipes, cakes, stuffed pies etc. Each of the Easter eggs are also decorated in different colors as each color stands for a specific religious symbol like red signifies Christ’s blood and green for fertility. Some of the most popular Easter destinations in Romania are the great historic towns of Sibiu and Sighisoara which houses some of the best architectural landmarks of the country, the splendid spa’s scattered in different parts of the country and the heritage castles situated in region of Danube Delta offers the visitors a unique romantic sightseeing. Thus, with such wide festivities Easter in Romania is a time of great celebration marked by huge funfair. Easter is celebrated with great zeal and enthusiasm throughout the world. On the occasion of Easter, the Christian community presents in every nook and corner of the world celebrates this day as the day of the resurrection of Jesus Christ after crucifixion. The celebration of Easter is marked by morning services at the church and feasting and party in the evening. 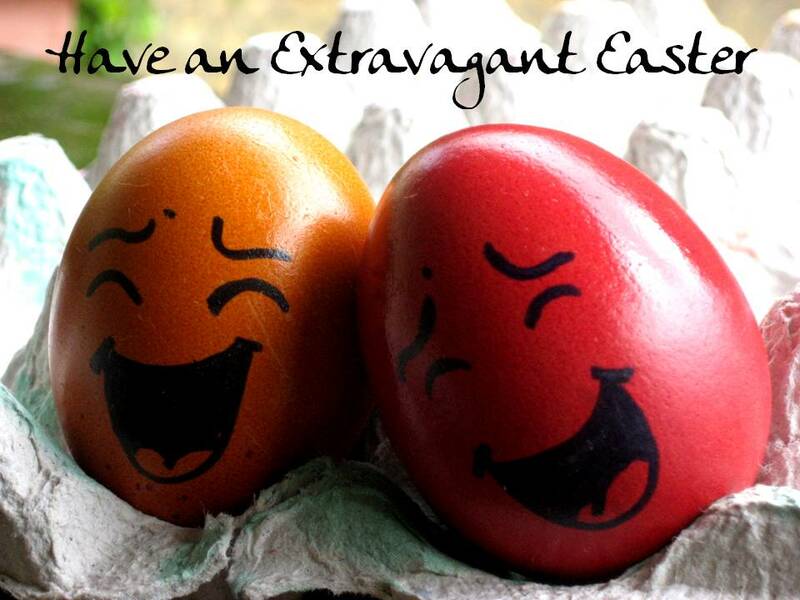 In almost all the countries around the world, the festivities of Easter are more or less the same. However, certain specific traditions of the place make the Easter at a particular country stand a little different from the other. 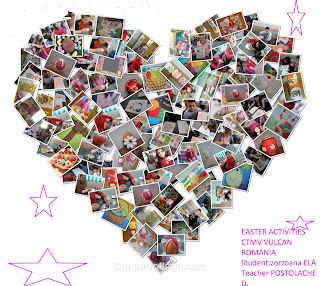 Here in this article we have explored the Easter celebrations in Romania. Easter in Romania is celebrated according to the rituals of the Eastern Orthodox Church. The Easter entire season consists of Flowers Saturday (Lazarus’ Saturday), Palm Day (Flowers Day), Great Thursday, Great Friday, Easter, The Small Fountain and Good People’s Easter. Each of these has small interesting rituals. The Easter celebration goes on for a long week and finally wraps with Good People’s Easter celebrated in honor of the ancient spirits. 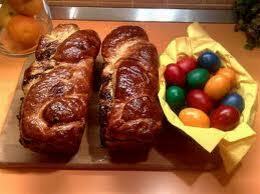 Easter cake (Pasca) is thetraditional cake that is usually baked on Saturday, Easter Eve. It is round, with a cross-shaped middle braid that represents the crucifixion of Christ. It is made made of cheese, egg yolk and raisins. Some people place coins inside the cake for good luck. The Easter lamb, steaks and meat pies are traditional dishes. Together with the Easter eggs and the cake, the meat is placed on the dinner table on Saturday evening, before midnight. At midnight, everybody goes to church to attend the Ressurection service (Invierea Domnului). The priest lights his candle first, after which all the people light their own candles from the first one with the "light of Jesus's life". They take these candles at home and give the "light" to the members of the family that did not attend the service. Everybody has dinner after the midnight service, with the lit candles on the table. The candles are kept for the entire year, as they are supposed to protect the house and people's health. The tradition of knocking the eggs must be respected: two people hold eggs in their hands and they break the other person's egg saying "Jesus is Alive" (Hristos a Inviat). The person that has their egg broken is considered weaker and must give their egg to the "winner." On Monday and Tuesday people visit their relatives and bring lamb, Easter cake and painted eggs for lunch or dinner to celebrate the Resurrection. For the next 40 days, people greet each other with "Christ is Alive" instead of the common greetings. 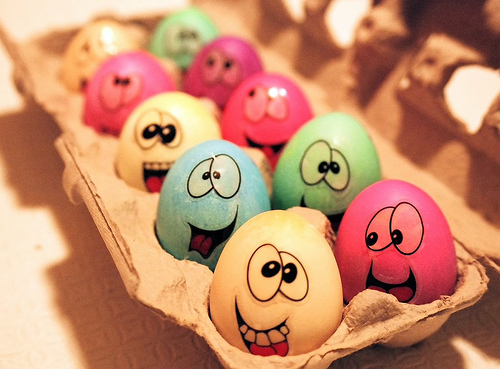 Easter is a celebration for the soul, it is a period of spiritual insight and improving oneself. It teaches us to be good, kind and to respect everyone and everything that surrounds us. The sacrifice of Jesus Christs is the symbol of pure love and hope. In Romania, many Easter traditions have been preserved until now. The celebrations starts with the Good Week, which begins with Palm Sunday, when Jesus entered Jerusalem and ends with Easter Sunday, when Christ resurrected. During this week, final preparations are made for the big celebration. On Good Thursday, also called Holy Thursday, people take food and drink to the church. In the same day, boiled eggs are painted, because they say that if the eggs turn red on Holy Thursday, they will keep without spoiling all year. The prominent color for Easter eggs is red, but other colors like yellow, green or blue are also used. In Romania, you will also see a special kind of painted eggs, with different geometrical and floral motifs, all with different colors on the same egg. The egg painting ritual has been kept to date but only a few people still master the art of egg painting. The process involves various paints and wax. This type of painted egg would make a great gift to your loves ones who live elsewhere in the world. Most of the colored eggs on Easter can be eaten, as they are boiled. These special eggs however are emptied of their content so you will buy only a colored, light shell. Another tradition related to eggs is that of tapping eggs on Easter day. Children usually have a competition to see whose egg has the thickest crust and can tap and break all the other eggs. This is usually done with normal, colored eggs that can be eaten afterward. The eggs tapping game also involves a saying with religious conotation: the first person says ‘Christ has resurrected’ (in Romanian, ‘Cristos a inviat’), while the second goes “True, he has resurrected” (in Romanian, ‘Adevarat a inviat’). The Good Friday is also called the Friday of Sufferings, because Jesus was crucified on this day. A tradition that has been kept in Romania is that of placing flowers at the church for Christ and passing under the table three times, signifying the pains Christ had when he carried his cross to his crucifixion. On the night between Holy Saturday to Easter Sunday, people go to church to celebrate the Resurrection of Christ by attending the midnight mass, where they light candles. After that, they take the lighted candles home, to have the holly light in their homes, souls and lives. In the Easter Sunday morning, people usually go to church for the Easter morning mass. This mass is however not as much attended as the midnight one. After that, they go back home and eat the blessed food which they took with them to the church. In Bucovina, on the night of Easter, there is the custom of “fires vigilance”. Fies are lighted on the hills and they would burn all night. In Transylvania, young girls are sprayed with perfume by the boys dressed in traditional clothes on Easter Monday. This way, they say girls will have good luck all year. In Maramures, children go to friends and neighbors to announce the Resurrection of Christ. If you will happen to spend Easter in a traditional Romanian family (or at a guest house that respects the holiday tradition), you will see several specific dishes on the table for the occasion. You will not miss ‘Pasca‘, the traditional Romanian Easter cake, sweet bread (cozonac), which is a slightly sweet yeast-raised egg bread, the lamb soup, lamb steak, haggis (drob) – which is a traditional national Easter dish that uses the organs of the lamb and of course the painted eggs.